Lately we have been talking about how you can use regular items around your house to do more than you might think. Vinegar is cheap and has so many uses around the house. However, you can use it for much more than just dinner. Instead of buying expensive products to do other things, try vinegar. What Can vinegar be used for? 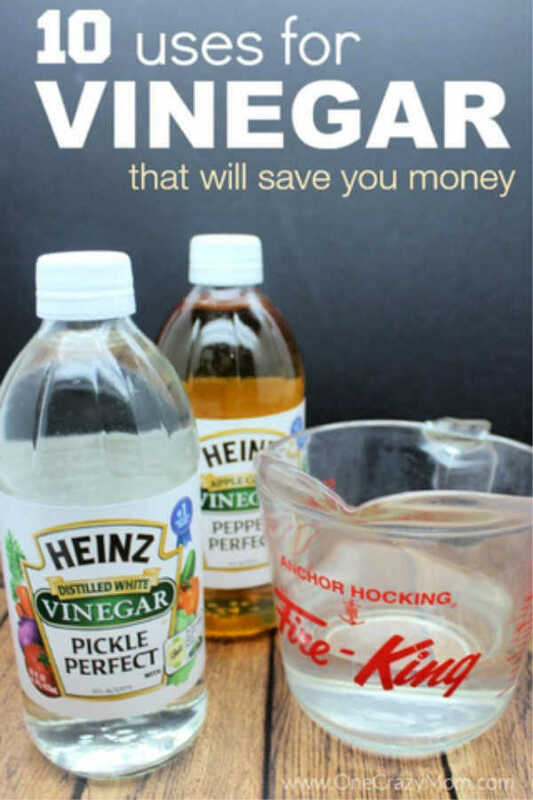 If you haven’t been using vinegar around the house, you should be! It is amazing what this one little ingredient can do. From washing fruit to cleaning the bathtub and even uses for your pet, vinegar can be used for so many different areas of your life. Keep reading to learn all about the many uses of vinegar. You might be surprised what one inexpensive ingredient can do! Here are some clever and good uses for vinegar that will actually help you save money. The bath can get quite dirty after much use and a lot of neglect. That doesn’t matter though, because you can clean your bath quick and easy with both baking soda and vinegar. Just give dirty areas a good dusting of baking soda, follow with vinegar, and scrub vigorously with a sponge while the mixture fizzes away. Rinse any leftovers with water. Make sure you have a window open so those fumes can go somewhere. Also, check out our posts for more clever things you can do with baking soda and vinegar together. All of us have suffered a nasty fall of some kind and those bruises can become extremely sore after a while. However, you can make all those nasty black-and-blues go away. Just soak some cotton gauze or clean cloth in a few tablespoons of white vinegar, apply it to the bruised area, and let it sit for around an hour. There are even medicinal uses of vinegar. You have a choice and can spend a pretty penny on some fancy “all-color, stain-fighting, super-effective” bleach, or you can spend a couple of bucks on some plain, white vinegar. Just add 1/2 a cup of vinegar to the water in your washing machine rinse cycle to reinvigorate and brighten all the colors in all of your laundry loads. Is the sink not draining as quick as usual? Chances are it’s probably a little clogged up by grime and such. All you need to do is pour roughly a quarter of a cup of vinegar and a quarter of a cup of baking soda down your drain, wait a little more than 15 minutes, and then follow it all down the drain with hot clean water (preferably boiling). You will be amazed what this vinegar and baking soda can do! Make sure to have a few paper towels handy for spills and easy clean up. We’ve all had to wait that dreaded 5 minutes every winter morning; the windows are slowly-but-surely clearing up and you’re already 10 minutes late for work. You can keep that frost off your windows with this easy tip. Spray a solution that’s 3 parts white vinegar and 1 part cold water on your car windows every few weeks. Hate having to hold your breath when open your trunk to put the groceries way, or maybe that musty old closet is getting to be a little too unbearable? You can freshen up the smell of these places quite easily! All you need to do is give a slice of white bread a soak in some white vinegar, place the soggy piece of bread on a plate, and keep it in that closet or trunk for a night. Things will start smelling good again in no time! This is a brilliant idea and so inexpensive! Whether you are the gardening type or you just took a stroll through the produce section at your local supermarket, you never know what’s clinging to the surface of your fresh fruits and vegetables. If you’re not feeling safe about your food, you can always try using vinegar. Wash the produce with 1 tablespoon of white vinegar mixed with 1 1/2 quarts of plain water for a nice, bacteria-cleansing wash. Easy! You can clean up old rusty tools real easy with full strength white vinegar. – just submerge them in some plain white vinegar for a couple of days until the rust is all gone. Pour a couple of cups of vinegar and watch this rust disappear. This is so easy and a really great way to have your tools looking good as new again with just simple undiluted white vinegar! If you have some vinegar, water, and dish soap lying around, you can make a window cleaner that outperforms most others. Put 2 cups of water, 1/4 of a cup of plain white vinegar, and 1/2 a teaspoon of your favorite dish soap/detergent all into a spray bottle. You will have clean, clear windows in no time at all with this easy vinegar solution. You can keep those bugs away by filling a spray bottle with equal parts vinegar and water and applying it to your dog or cat’s coat before rubbing it in. This is a great way to avoid chemicals and treat your pets all naturally! I like to use the vinegar and 2 tablespoons water to dilute smell. As you can see there are many uses of vinegar in daily life! Don’t forget about apple cider vinegar uses. This type of vinegar is also good to deodorize, preserve food and more! What does vinegar do to your body when you drink it? Many people rave about the benefits of apple cider vinegar. It is very acidic so you certainly don’t want to drink it without being diluted. There are lots of health benefits of drinking vinegar. From vinegar uses for health to white wine vinegar uses for pets and more, there are many uses for vinegar. You can even add white vinegar to the water in the vase of cut flowers to make them last longer. There are so many wonderful vinegar uses! 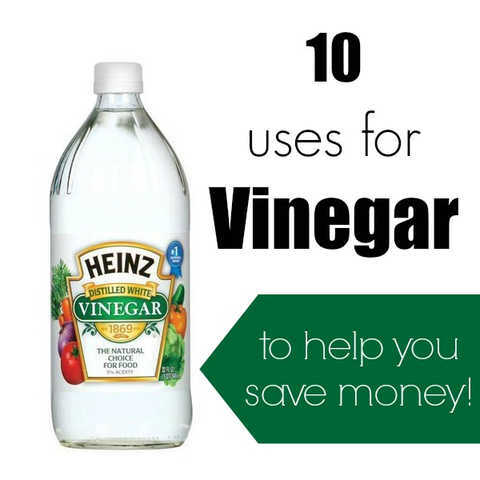 Get started today and you will love how well vinegar works and how frugal it is. It’s amazing! You are going to wish you started using vinegar sooner for all of these great uses. It truly is such a great item to keep on hand around the house for so many great things. If I can find something that not only works great but saves me money, I’m all about it! 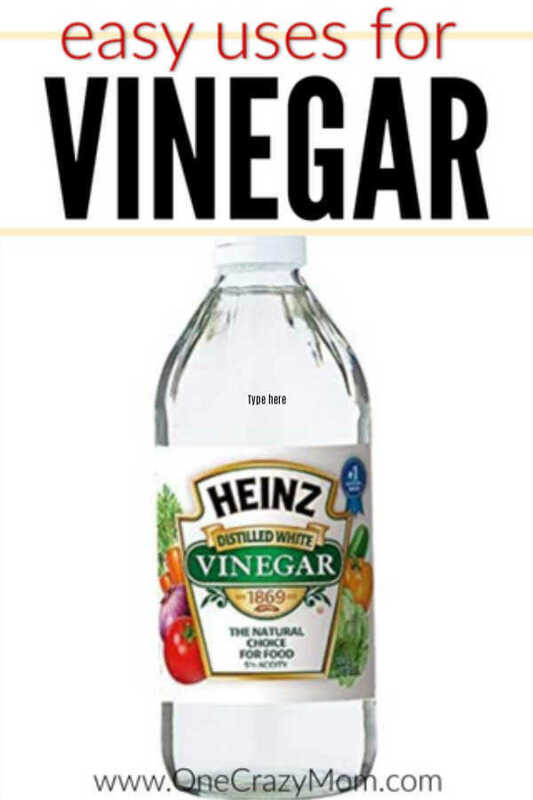 You will love using vinegar. We keep a big bottle at home at all times so we can always use it for these great ideas. There are so many uses and it really is such an inexpensive ingredient that does lots of amazing things. From cleaning to your skin and the pets and more! Who knew one ingredient could do so much. I love learning new ways to give my family natural products. It saves money and keeps all the chemicals and less desirable ingredients out of our house. You can literally use this one ingredient for multiple uses around your house and more! We love making products at home and before long, I was able to have lots of different products to use that we had made. There are several things we have made recently including Homemade Carpet Cleaner. With only 2 ingredients and vinegar being one of them, it is so cheap to make but works great to keep my carpet fresh and clean. Learn how to clean a dry erase board that will get rid of even the most stubborn smudges without harsh chemicals. This DIY solution is budget friendly and works to clean your dry erase board perfectly. Avoid those over priced products and try these vinegar uses instead. Do you have any extra tips on ways to use vinegar to save money? Leave a comment and let me know! We are always looking for more ways to save money and creative ways to use items we already have at home. 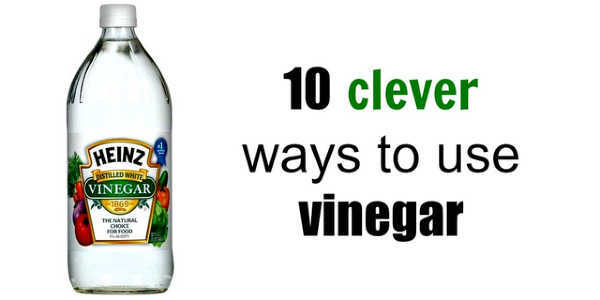 Thank you for giving us all these good tips about white vinegar and all its uses. one thing i know is that, vinegar is good to fight bad odor on feet, also to fight fongus on feet and toe nails. Thanks again, I just started reading Pinterest. Thanks for sharing those additional ideas for the use of vinegar Juanita! It’s also really good for sunburn. Any time I’ve gotten too red, I soak the area in vinegar and it’s tan by the next day. No soreness or itchiness to contend with. Awesome! I’m so glad that you are enjoying the blog. Thank you!